In this review we explain that Black Diamond 1 is an investment scam that is going to collapse. Black Diamond 1 supposedly is a company involved in cryptocurrency, Forex and stock trading. 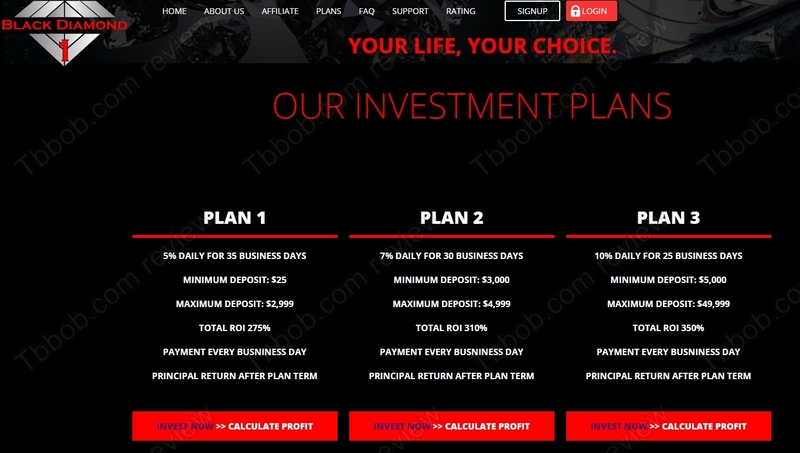 The company offers three investment plans with returns up to 10% per business day, which means more than 200% per month. Can you really double your money every month this way? No, you cannot double your money every month, because Black Diamond 1 is a scam. No legit business can double your money every month, that’s just a fact. BD1 is just a Ponzi scheme. So, it collects deposits and for some time it will be using new deposits to pay out profits. But such a scheme is obviously doomed to collapse very fast, because withdrawals will exceed deposits very soon. Black Diamond 1 shows a company registration in the UK, but you should know three important things about it. The first is that the registration is only a few weeks old. The second is that it is only a tax registration that almost anybody can get, it says nothing about the legitimacy of the business. The third is that investment services provided by Black Diamond 1 are a regulated activity in the UK, but the company doesn’t have a licence from the Financial Conduct Authority, so it is illegal. Black Diamond 1 is a Ponzi scam that is going to quickly disappear with all the remaining money. Stay away from it! If you want to see what profits are really possible in financial trading, try a free demo account with a regulated broker. On the demo you will also see that you need to develop a robust strategy before you can start investing real money.